"Every membership paid helps the Federation to provide the services we sometimes take for granted and these are the services that help make us what we are." 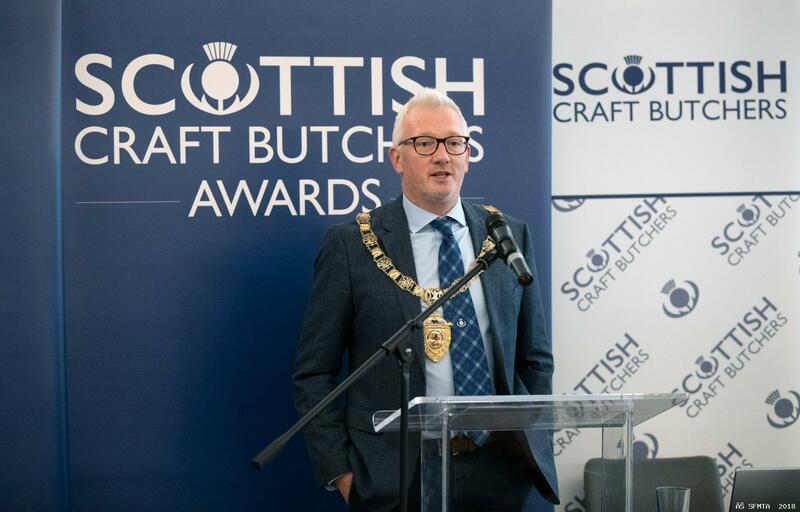 "Firstly, let me say, that it really is an honour and a privilege to be the President of the Scottish Craft Butchers, following in the footsteps of both my father and uncle. And, as President, my first job is to thank Paul Boyle for being such a committed and brilliant representative for our trade, and I hope, sir, that I can be every bit the President that you have been. However, can I just state, for the benefit of this room, that things don’t always get better!!! 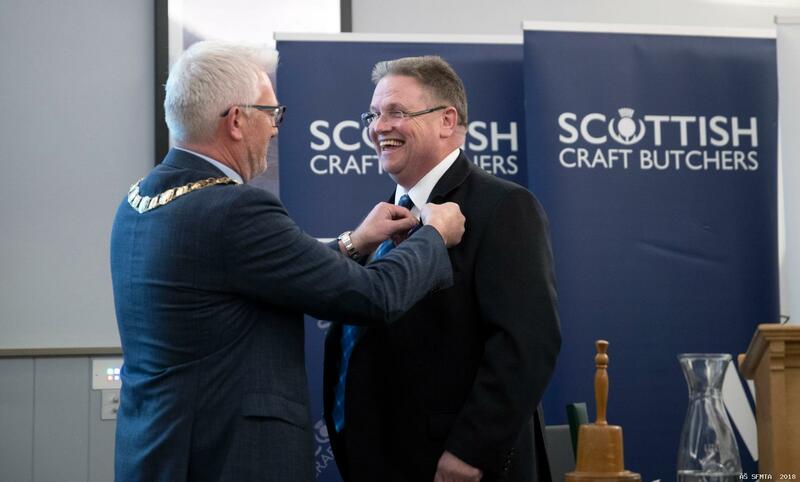 Paul has spent the last two years attending an incredible number of executive and regional meetings, and he has travelled far and wide to meet as many members as is possible – and throughout this time, his shop has gone from strength to strength. Paul’s achievement’s in our industry are exactly the example of what is possible with a combination of hard work, quality products and a team of good people behind you. Paul – I wish you well for the future, and hope that your retirement as President doesn’t mean that you will stay away from the federation, as your input is invaluable. 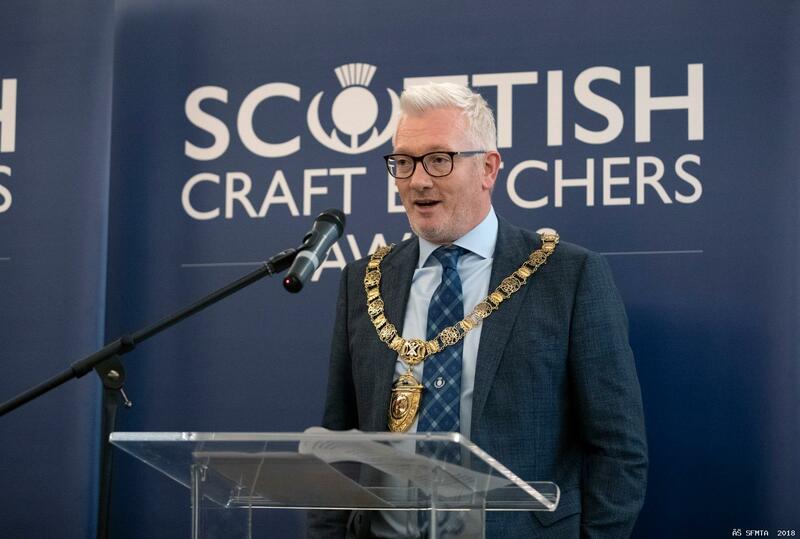 I, personally, am also looking forward to being The World Scotch Pie Champion that this title as President, clearly grants you!! When Douglas first suggested that I should consider the role as President Elect, I was fearful of accepting. Not only because of the time commitment that the role dictates but also because of the daunting experience of speaking in front of all you. However, I then realised that I had this massive opportunity to really play a big part in influencing those that try exceptionally hard to make our lives difficult. People such as the Scottish Government with their relentless pursuit for the profits of small business, and people such as those in Food Standards Scotland and the local environmental health services. They have an important job to do, but we all have our own favourite terms of endearment! This is the point in the afternoon when Douglas has just realised that the speech I now deliver, is nothing like the one I originally sent him!! I grew up in this trade, from about the age of 7, working in my father’s shop located in the Hilltown area of Dundee – sweeping floors and washing dishes. 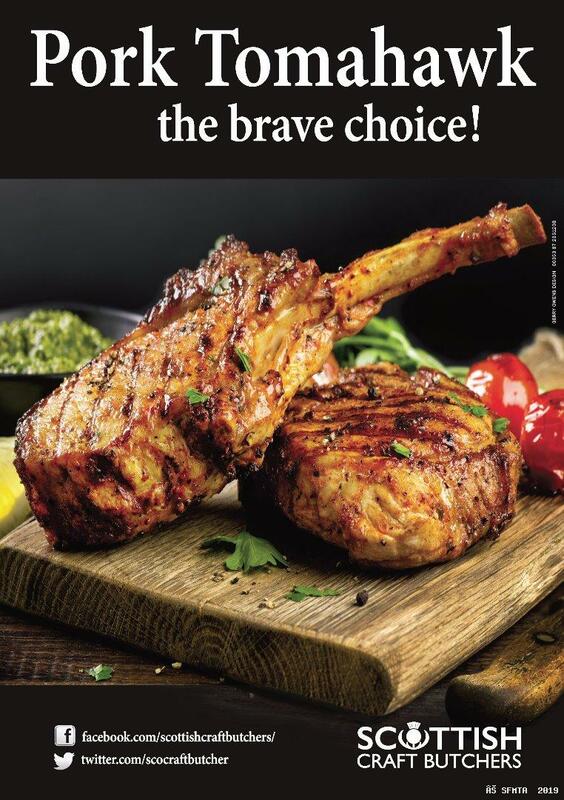 These were the days when the only competitive threat to the butcher shop, was the neighbouring butcher shop. These were the days when customers shopped almost daily for fresh produce. And, these were the days when pest control was carried out by an air rifle, and a cat called Regan! Ray was my dad’s head butcher, was a colossus of a man, and loved a dram or two. I knew he was a man who was fully versed and respectful of the hygiene regulations of the time, because I never once saw the ash fall off the fag in his mouth, onto the table when he was working! It’s time to get a little bit more serious though, because most of you will want to know what I’m going to bring to the table, as your President. This trade that we all work in has a fabulous history, and it’s a trade with a bright, bright future, and this is the federation that has supported each and every one of its members through some very difficult and challenging times – most significantly in more recent times. Not much has changed in terms of why we need this federation. The world now moves at the blink of an eye, and this federation needs to be capable of keeping pace so that we are able to conduct our business with confidence. This Federation is the body that represents our industry at government level, that helps to train the next generation of skills, and this is the Federation that partners up with other professional advisers to make sure that there is the required support in place, and when we need it. As a small business owner, you are expected to be a butcher, an accountant, a banker, a technical manager, an engineer, a food technologist, a marketing agent, and a human resources manager. There are very few people who can be all of the above, to the level that is required to stay abreast of an ever changing business environment, but the Federation is here to help. My ambitions as President are to make sure that the Federation continues to be this service to you. 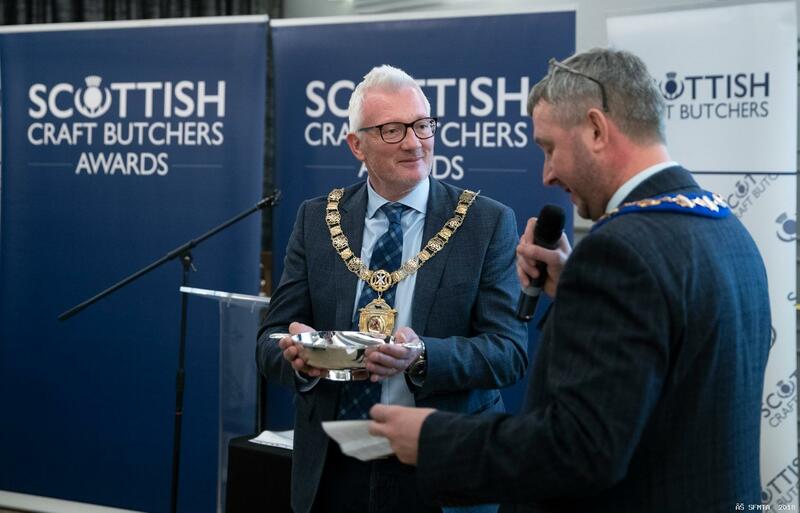 There are over 400 butcher shops across Scotland that have made the decision to be members of the Federation, and that’s 400 members experiencing different economic environments, different standards of inspection, and different consumer demands. Imagine the wealth of knowledge within all 400 of us, as a collective. We need to build within this community of members, a community forum, so that we can ask each other questions, and discuss industry issues. We would be able to share success as well as challenges – someone always has an answer, it’s just teasing it out. I’ve seen this work elsewhere, and it’s something I’d like to see work for us. However, it’s definitely not for holiday pictures!! Or anything else!! 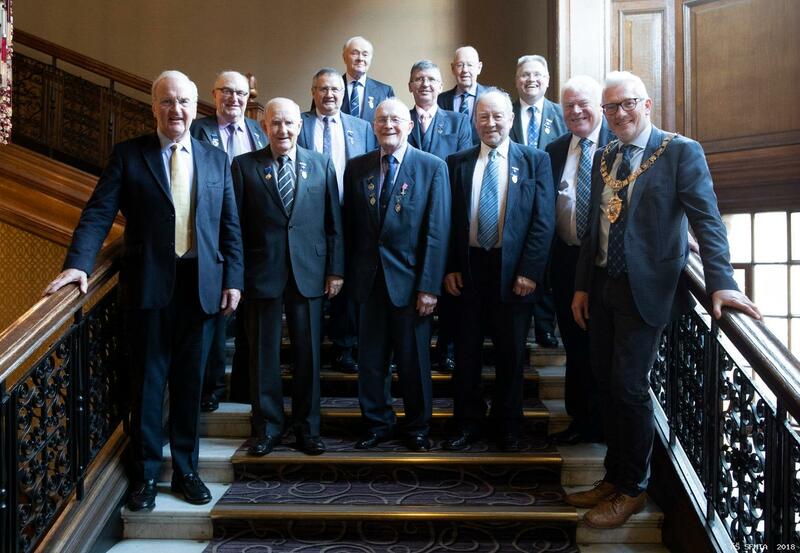 President Scott Jarron (right) with Past Presidents and Honorary Presidents - Left to right - Jim Royan, Sandy Crombie, Arthur Matthew, Bruce Brymer, Wilson Ferguson, Jim Ewing, Duncan MacKenzie, Adam McLay, Stuart Christie, Paul Boyle and Ian Faulds. The world is getting smaller as channels of communication become bigger and faster, and we should be able to use this to connect Scotland. 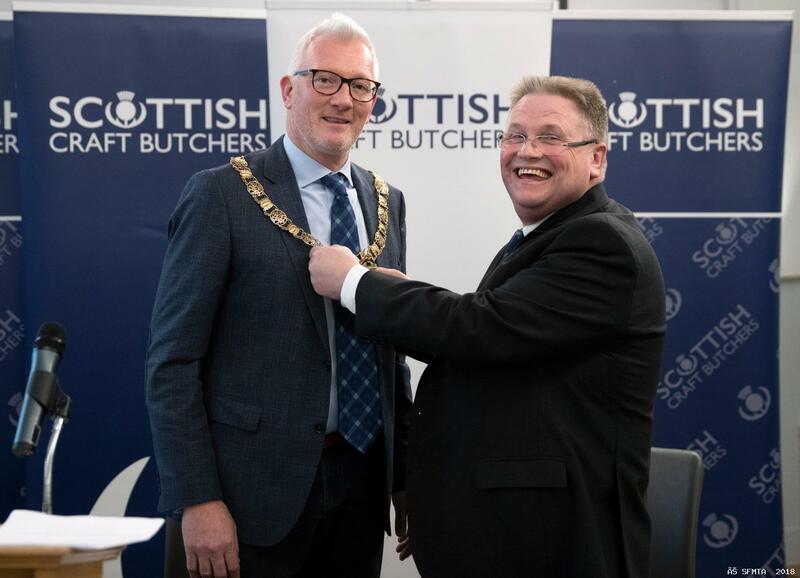 My challenge is to make sure that each and every member knows what the Scottish Craft Butchers can do to help their business, so that moving forward, every butcher shop feels that membership is an investment and not a burden. Every membership paid helps the Federation to provide the services we sometimes take for granted and these are the services that help make us what we are. My other challenge is to find a new Chief Executive, because as most of you in this room will know, Douglas Scott is retiring next year. Douglas has committed the past 17 years to the Scottish Federation, and in my mind, has been key to the federation’s modernisation. He has fulfilled his role with passion and intelligence, and has been one of the greatest advocates for our industry. These are big shoes to fill, but nothing ever lasts forever and whilst it will be tough, I and the other committee members have started the search for the right candidate. On the subject of roles that need to be filled, I need a President Elect, and whilst I have a few ideas for that candidate already, as I chat around the room at the end of official proceedings, I may just come up with a few more! Ladies and gentlemen, I hope I can be every bit the President that Paul has been, and I thank you for being in attendance and listening to me.